“The word ‘underappreciated’ comes to mind when discussing Demetrious Johnson. Having already dispatched nearly every defensible contender, the man they call “Mighty Mouse” is knocking on the doors of MMA history. He was last seen in September, when he took a clear-cut unanimous decision over John Dodson. That was his seventh title defense, tying him with former featherweight champion Jose Aldo for the fourth-most title defenses in Ultimate Fighting Championship history. In each of those defenses, Dodson was the only one who managed to steal any rounds from him, making Johnson arguably the most dominant champion the UFC has ever seen. He fought twice in 2015; this is his first fight of 2016. 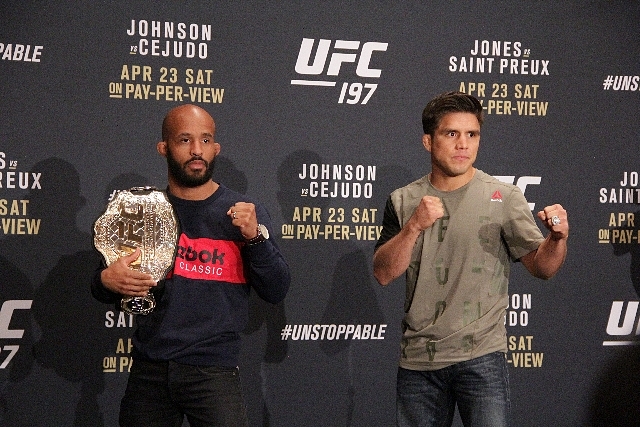 Standing across from him in the UFC 197 co-main event on Saturday will be the highly touted Henry Cejudo. The undefeated prospect and former Olympic gold medalist made his UFC debut in December 2014 and has only fought four times in the promotion. However, he has impressed in each bout, utilizing his athletic and technical gifts to take one-sided decisions every time out. He was last in the Octagon in November, when he beat Jussier da Silva in what was perplexingly judged a split decision. It was the third fight of the year for “The Messenger,” who was dubbed a potential heir to Johnson’s throne in his first UFC fight; this will be the first time he fights in 2016.